I realize this is a bit lazy of me to re-post another entry from a while ago, but I feel the story of General Terrill is worth retelling and this is the best way I know to do so. As the 150th anniversary of the Battle of Perryville draws nearer, it is appropriate to review that battle, including some of the participants. One fascinating story from that battle belonged to William Rufus Terrill, a general in the Union Army. Brigadier General William Rufus Terrill commanded a brigade in the Army of the Ohio during the fall of 1862, including at this fight among the Chaplin Hills of Kentucky. His life and service in the Union army provide just one example of the brother-against-brother nature of the war, especially in Kentucky, a state more divided by the war than just about any other, perhaps with the exceptions only of Missouri or Maryland. A native of Virginia, Terrill faced family pressure similar to that confronting another, more famous, Virginian who chose to support the Union and who was present when the armies collided in this small Kentucky town- George Thomas, later known as the "Rock of Chickamauga" and the namesake of a future military base, Fort Thomas, Kentucky . Now, in early October 1862, here was William fighting in the west, in a state where prominent and nationally-known families like the Crittendens, Breckenridges, the Todds, and, by extension, even the Lincolns found themselves facing similar familial divisions as did the Terrills and Thomases. At Perryville, William commanded a brigade of inexperienced men who were soon to experience their baptism by fire. In the early afternoon, his men held a position on land now known as the Open Knob or Parson's Ridge. As Confederates commanded by George Maney approached and attacked this hill, Terrill's men could no longer maintain their position. The Confederates captured several cannon, and drove Terrill's men down the back of the hill and through a cornfield. The Union men did not stop until they reached the top of another ridge, where they met the men of John C Starkweather. The Union men rallied here and fought off the Confederates bravely, but eventually the southerners took yet another position from them. Soon enough, though, daylight began to disappear, and the action here proved to be the last fighting in this sector of the battlefield (the Confederate right.) The battle itself would end around two hours later as autumn darkness began blanketing the hills and valleys in the region. It was early during this fight on Starkweather's Hill when an artillery shell hit General Terrill, createing a mortal wound for the general who had been trying desperately to hold his lines together and rally his men. William Terrill was just 28 years old when he passed away on October 8, 1862. 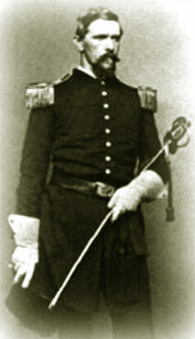 He had been born on April 21, 1834 and had entered West Point in 1849, graduating 16th in his class four years later. He later served as a professor of mathematics at the academy, but his most notable experience on campus occurred during his cadet days, when he got into a fistfight with Philip Sheridan, resulting in a one year suspension for the future Union hero of the Shenandoah Valley. According to Noe's book (pages 187-188), Sheridan, who also fought at Perryville, "despised" Terrill terribly after their time at West Point. Sheridan did, however, later claim that the two men had met on the night before the battle and had ended their feud and enjoyed a pleasant evening. After graduation, Terrill, besides his teaching job, fought in the Seminole Wars and spent time in "Bleeding Kansas." His early Civil War career included time as a captain of artillery and as the head of a battery of artillery at Shiloh and in the eventual siege of Corinth. He gained his promotion to Brigadier General in early September 1862, only a month before the fatal fight at Perryville. Not only had both brothers served in this war on opposite sides, but both lost their lives during this conflict, a sad and powerful symbol of the tragic nature of the war, when a "house divided against itself" finally collapsed, leading to enormous suffering, loss and sadness on both sides. Even the best-laid plans of loving mothers could not avoid such tragedy. Thanks to the following links for providing helpful information and details on the Terrills and the battle. It's a little amusing to think what would happen if coverage companies like philippine prudential life existed back then. With so many deaths left and right, the number of claims daily would probably be through the roof. Correction - it was not General Terrill's mother that sought his transfer to the West ... it was his mother-in-law, Arietta L. Henry. Correction - it was not General Terrill's mother that requested his transfer to the western area, it was his mother-in-law Arietta L. Henry. For those who would like to read more about the Terrill's, please get a copy of "God Alone Knows Which Was Right". For those who would like to read more about the Terrill's of Bath County, Va., please get a copy of "God Alone Knows Which Was Right."